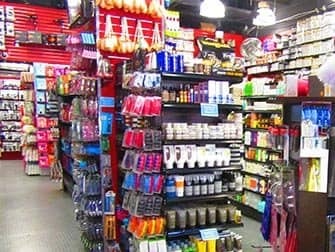 You can find the largest selection of cosmetics, personal care products and make-up in New York. You can also buy items from brands not available in Australia. Drugstores, chic boutiques or department stores are the places to go to for makeup and personal care products in New York. 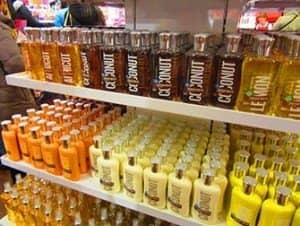 But stores like Victoria’s Secret also have beautiful beauty products. Whatever you’re looking for, if you’re a cosmetic lover you’ll be amazed! Make sure you leave some room in your suitcase! Also important: products are generally a lot cheaper than they’re in Australia! Thanks to international blogs, tutorials and TV programs, we’ve become more and more familiar with products and brands not available in Australia. You can find them in America and they’re well-priced too! Lots of people buy ‘redness relief eye drops’ for instance, droplets with a calming effect on red eyes or eye strain. The lip balm ‘Rosebud Salve’ is a popular export product among female travellers too. And don’t forget the Lady Speedstick deodorant! I asked my wife which New York stores sell the best beauty and skin care products. Below you can find a collection of the best tips! True beauty fans just have to visit Sephora. 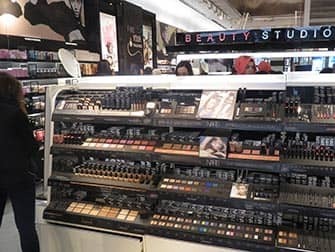 This department store completely focuses on body care, featuring brands like Bumble & Bumble, NARS, Make Up For Ever (MUFE), Urban Decay, Kat von D. and Rosebud Salve. 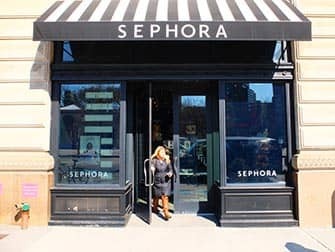 You’ll find the most beautiful Sephora store on 119 Fifth Avenue. 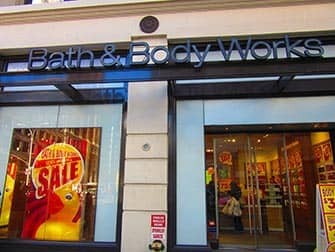 Bath & Body Works is always busy and not without reason: the store sells fun and affordable products and regularly offers good deals. But beware, can you resist deals like ‘Buy 3 Get 2 FREE’ or ‘4 for $ 20’? You’ll find everything in the field of body care, but home items such as scented candles too. 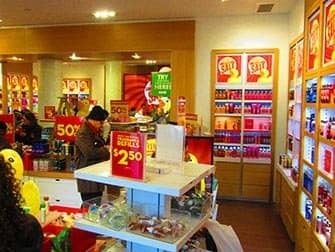 Cosmetic Market has both cheap and exclusive brands. Products are usually not from that season and that’s why they’re heavily discounted. Think of nail polish for $1.50 or luxury foundation for $5. It’s like an outlet, but browsing around definitely pays off! Check before you head to the cash register if you’ve got the right colour, sometimes products and packages are swapped. American drugstores are very interesting to go to. They offer a huge assortment, even toys and baby food, and everything is dirt cheap. 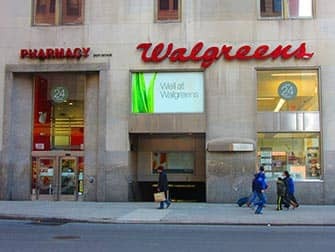 Well-known drugstores are CVS, Duane Reade and Walgreens. 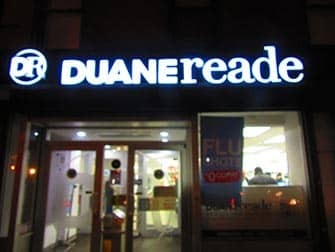 Some branches of Duane Reade and Walgreens are open 24 hours a day. 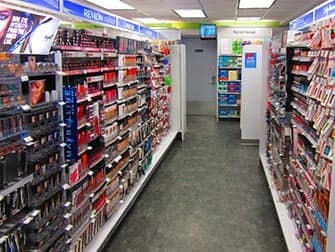 Most drugstores offer you a loyalty card that offers many benefits when you’re regularly purchasing products in New York. 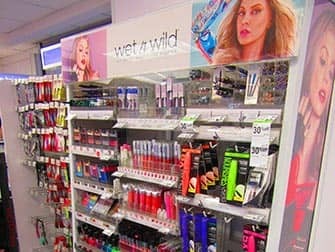 These drugstores sell items from brands hard to get in Australia, such as Milani, Neutrogena and Wet ‘n’ Wild. You also find the well-known brands L’Oréal, Revlon, Rimmel and Maybelline here. St. Ives beauty products (try the ‘apricot scrub’!) and Aveeno are very popular. At e.l.f. you’ll pay about $3 for a lipstick, mascara or eye shadow – you name it! More luxurious items cost about $10. ‘e.l.f.’ means ‘eyes lips face’ and you should drop by! There are two New York branches. e.l.f. Downtown is quietest. It’s a good store to buy presents, but mind you: they won’t wrap it for you. Now you’re shopping there anyway, why not go to Century 21! In addition to the bustling, large drugstores and department stores, it’s definitely worth taking a look at smaller and specialised boutiques. In SoHo, you can find the only NARS store in the world for instance. This famous brand’s flagship store is a nice, small and quiet. They sell all of their own products. In the same street, you’ll find Bond No. 9, selling gorgeous perfumes. These perfumes are quite expensive, but just nosing about (with your eyes and nose) is a pleasure in itself. Another beautiful perfumery is Le Labo in NoLiTa (North of Little Italy). Here you can find ‘soulful fragrances’, high-quality perfumes. There are some classics like ROSE 31, SANTAL 33 and TUBEREUSE 40 (only available in New York). It’s even possible to design your own label. A perfect store to find your gift! Space NK offers a wide range of luxury cosmetics. The brands might be a little less known to us. The store is well decorated and all items are displayed in an orderly manner. A good opportunity to go on a quest for new products! M.A.C. is one of the larger well-known brands with different stores in New York. The large and crowded flagship store is located on Times Square. Head to Greenwich Village to find a smaller and quieter branch. Shopping at M.A.C. in New York happens to be quite cheap as well! And have you ever heard of Ricky’s N.Y.C.? It’s a really cool store! 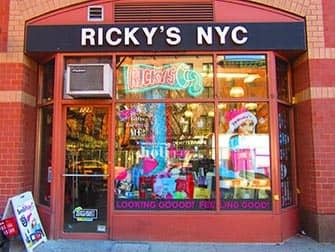 Ricky’s N.Y.C. sells lipstick and hair dye in all colours of the rainbow, but also wigs and masks for instance. In some branches, there’s even a hairdresser: Revolver Salon. In the Broadway branch, you can get your hair coloured by a team of Manic Panic. At Ricky’s N.Y.C., you can also buy NYX products. According to the experts, this brand is great value for money. At luxury department store Macy’s you’ll find items from brands like Chanel and Dior. Tip: ask for the shopping pass that gives you a 10% discount! Bloomingdale’s is similar to Macy’s: you can find the famous, luxury brands here as well. Bloomingdale’s, however, is a bit more spacious what makes for some pleasantly shopping.